I do love the winter in Flagstaff, even though I have to remove the frost, snow, and ice from my car. 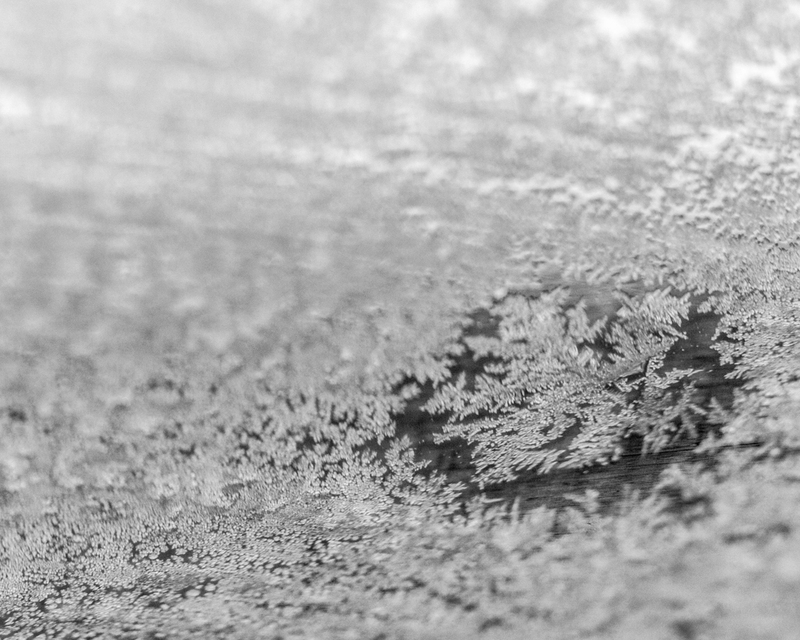 I’ve always wanted to take a close-up photo of ice, snow or frost. One day, I was getting into my car and I noticed there were larger flakes, so I immediately grabbed my camera from my apartment. Often I’ve been angry about having frost and snow on my car, but this photo has helped me realize I don’t need to get upset, and just appreciate the phenomenon that occurs. The image brings me a touch of calmness. Now,I feel a connection to appreciate rain, snow, frost, ice. When I got the idea of the photo, I grabbed my Canon T1i with my Canon 50mm Prime lens to shoot, but I thought it would be better to get my macro extension tube. So, I ran back to my apartment and grabbed the tube. I knew Auto Focus would be useless, so I switched into Manual Focus so I could freely focus. I took a lot of photos. Trying to get it balanced. I thought it was quite irritating. After that, I had to search for a prime target. But I had no luck of getting a shot I enjoyed. But then I found this snow flake within its “personal bubble” I thought it would be fantastic to get a shot.I really like how the blur looks as if the strong blur is a tidal wave about to attack the snow flake. So I finally got an exposure of 1/90th second, F/2, ISO 800. Using the macro tube, I had an amplitude of ideas for a subject. For this shooting, I used an UV filter, and an ND8 filter. My primary focus point was the lonely snowflake even with a slightly blurred flake, it makes me feel that it is starting to melt. After taking multiple shots, I took my favorite and brought them into Lightroom. I decided to add more clarity so it was smoother; I also made a slight color change and a tad shift to the exposure. I shot various photos that gave different formations and details. Even though I had a variety of favorite photos, this one is a personal favorite. My name is Niko Chaffin, I have a creative mind. I tried drawing and sculpting, but, I didn’t feel satisfied in such media. When I got my first digital camera, it was cool. That basically shot off my interest of photography. I could evoke different moods. Photography was my hobby. When I switched to the photography major, I found a possible career path. Since my minor is criminal justice, I am thinking to become a crime scene photographer, and possibly try to come noticeable with various Medias. I’ve taken photos at my high school during prom, dances, or expeditions. I loved doing it. Photography is my passion, I love photographing family vacations, macro or shallow depth, and cityscapes. On my last day at home in Prescott over winter break, there was a pretty intense snow storm. It finally stopped snowing a few hours before I was supposed to leave, so I decided to go out shooting on some of the trails that run through our neighborhood. My parents’ house is on the outskirts and in the higher elevations of Prescott, so when it snows, we often get the brunt of it, and the city snow removal usually comes to plow our neighborhood. There was at least a foot of snow, and at some parts of my trek, I was knee-deep in it. Unfortunately, I was underdressed because I thought that Prescott winter weather couldn’t be nearly as bad as Flagstaff winter weather, so the snow completely soaked through my jeans, converse, and socks, the wind was cutting through my sweatshirt, my nose was running, and my gloveless hands were frozen and stiff by the time I arrived at this location. I had walked so far out along the trail that I could no longer see houses or hear cars. 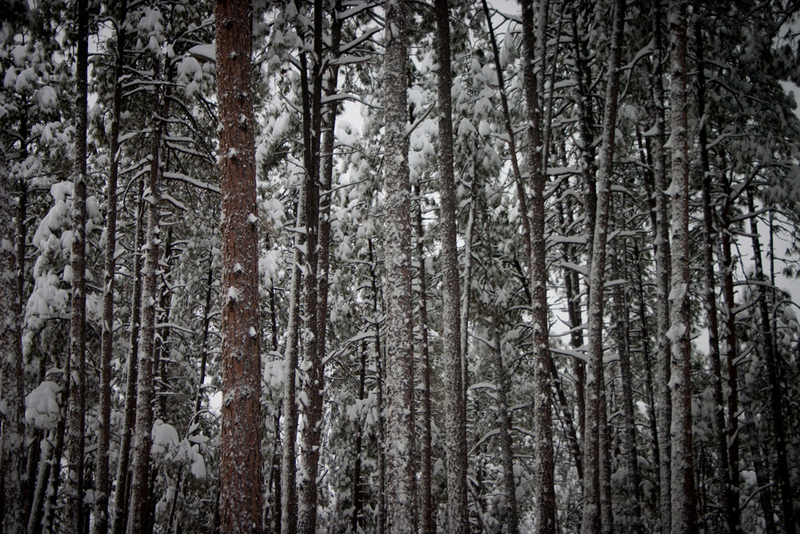 There was nothing but the trees, snow, wind, and myself. It was an incredibly peaceful place, and had I dressed more warmly so as to not be freezing my ears off, I would have spent much more time there. I wanted to capture this sense of complete and utter seclusion by shooting the wall of trees that surrounded me. This was before I could afford to buy my own DSLR, so I was shooting with my mom’s old Canon EOS Rebel. I had the aperture at f/5, the shutter speed at 1/2500 so I could stop the movement of the wind in the branches, and the ISO on 200. I later used minor post processing in Adobe Lightroom. After shooting this image, I realized I was two hours late for the time my dad and I agreed on to drive back up to Flagstaff, and my cell phone had no service. I quickly hopped and shuffled my way back home through the snow, and soon my phone was able to receive service again, I found that my parents had called and texted me at least 10 times. I finally returned, happy to finally be back in a warm house and dry clothes, and to have had a good morning shooting, but my parents were less than pleased with me. My name is Marissa Molloy, and I am a Junior at Northern Arizona University studying Theatre Technology and Design and Photography. I decided to take a photography class freshman year as an elective, and I haven’t been able to put it down since. I believe my experiences in technical theatre influence my work in photography in a unique way. I can find inspiration in many things, like interesting color or line. Nature and landscape photography, as well as product and still life are my favorite things to shoot, and are my strong suits. If you like this photograph and would like to see more of my work, please check out my website. http://marissalynnmolloy.wix.com/molloyimaging. 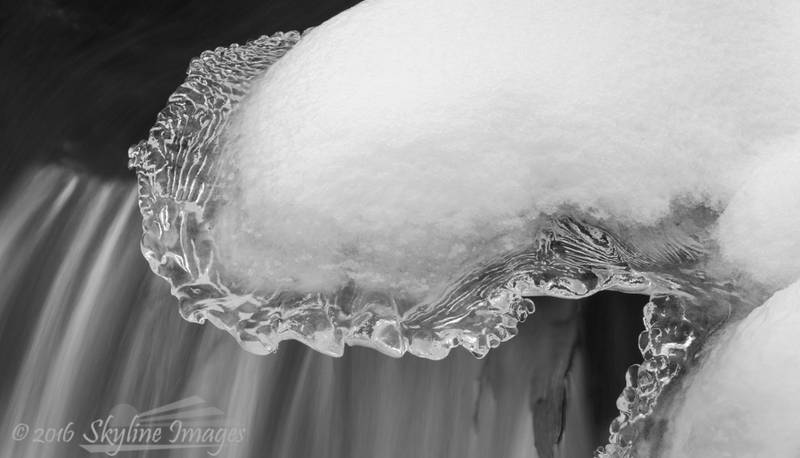 March 2013 Print of the Month: 30% Off: “Ice Hoodoos” Prints! The Artist-in-Residence program within the National Park Service offers professional visual and performing artists, writers, and composers an unprecedented opportunity to explore and create their art in inspirational locations across the United States. Though each park operates their individual programs separately and differently, almost all of the participating locations request the artist donates a single piece created during their residency. 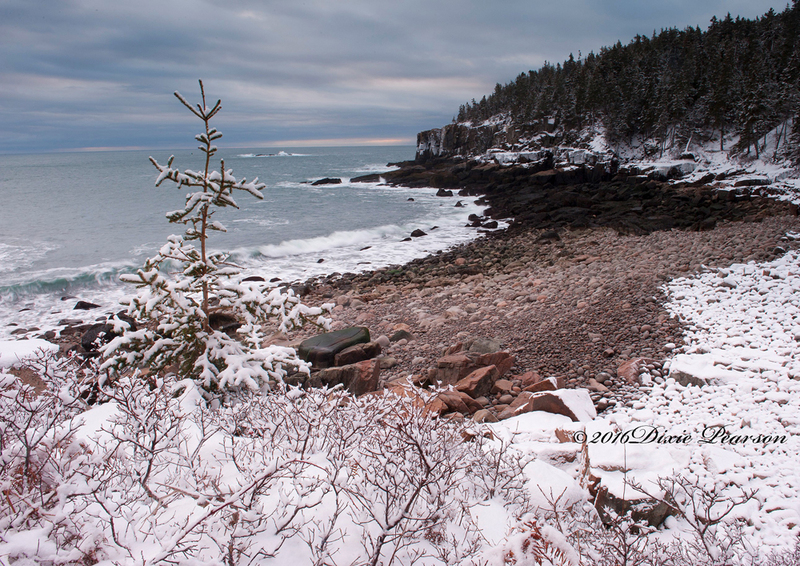 With my third Artist-in-Residency in Acadia National Park in Maine completed as of late February, I needed to make a decision as to which of the thousands of frames I snapped in my month-long stay would be THE chosen one. 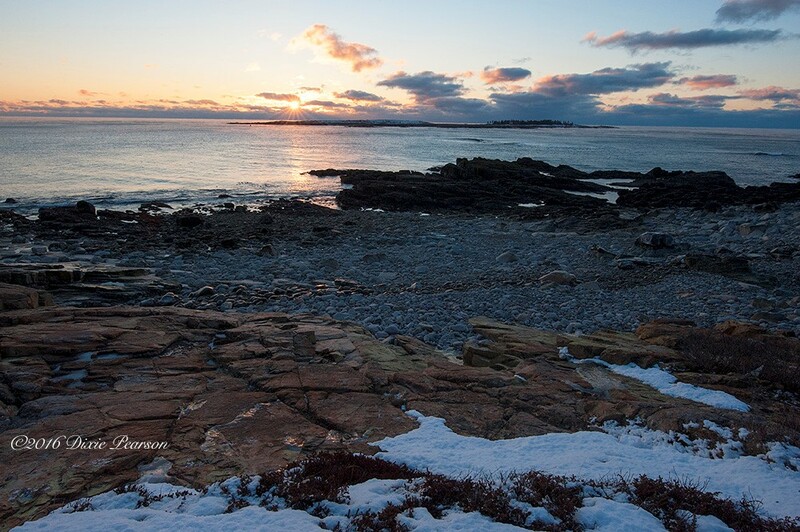 It was important to me that the selected image clearly expressed what winter was like for me in this coastal park – full of cold, ice, fleeting moments, and beautiful sunrises and sunsets. Given that criteria, I’ve selected “Ice Hoodoos” to be my donated print for my winter residency! 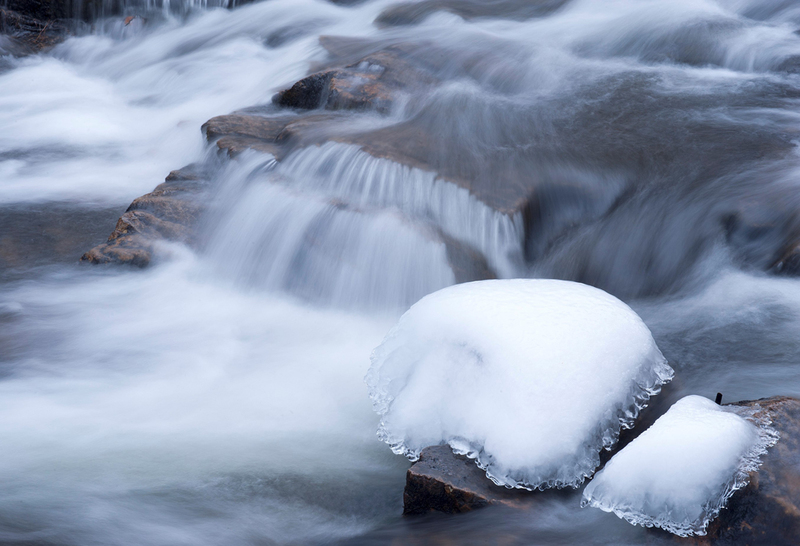 I’ve also selected this print to be our print of the month for March 2013, which means now thru March 31, 2013, visit our website and use coupon code 0313POTM01 to receive 30% off any size or style of this print. As with each Print of the Month within the collection, in addition to your print, you’ll also receive a one-page write-up on the story behind the photograph, which will include specific location information, technical details, and photography tips to help encourage you to get outside and enjoy nature. As an added bonus for this print, we donate 10% of the profits from all prints sold from the National Park Service via the National Park Foundation. 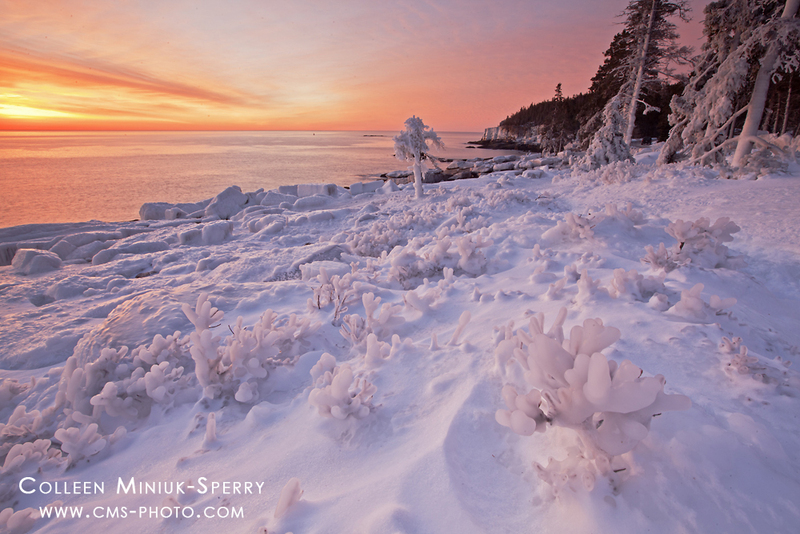 This print will join my two previously donated prints – “Lighting the Way” of Bass Harbor Head Lighthouse and “Season of Change” from the Schoodic Peninsula – in the Acadia National Park collection. 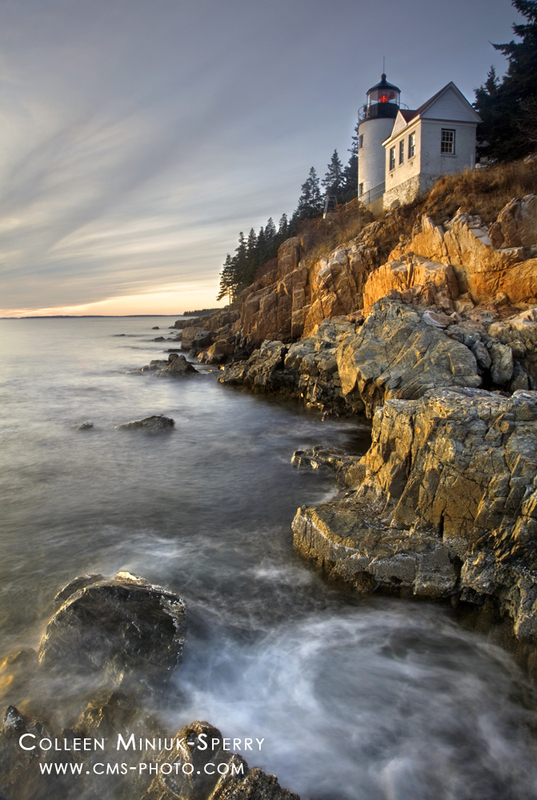 If you are interested in learning more about how you can participate in the rewarding Artist-in-Residence program at Acadia National Park, please visit their website at www.sercinstitute.org/education/artists-residence-0. Though the application process is now closed for the 2013 season, mark your calendar to apply starting this October for the 2014 season! 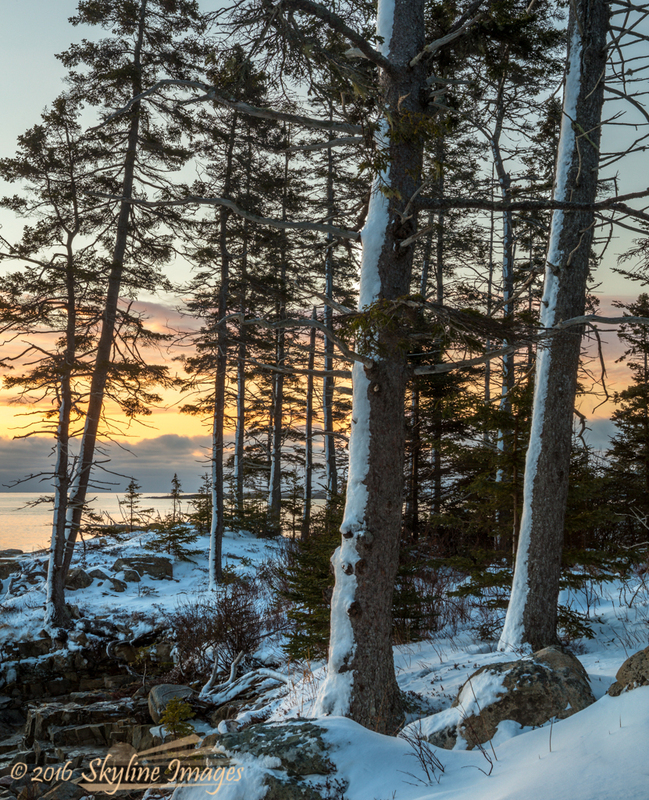 You’re Invited: "Connecting With Nature Through the Lens" Presentation This Friday in Acadia! 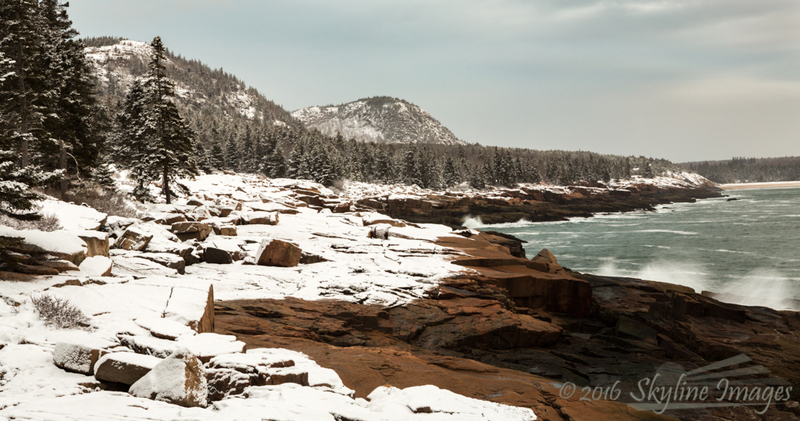 Ice Hoodoos along Ocean Drive, Acadia National Park, Maine. Prints available – click on photograph to order! 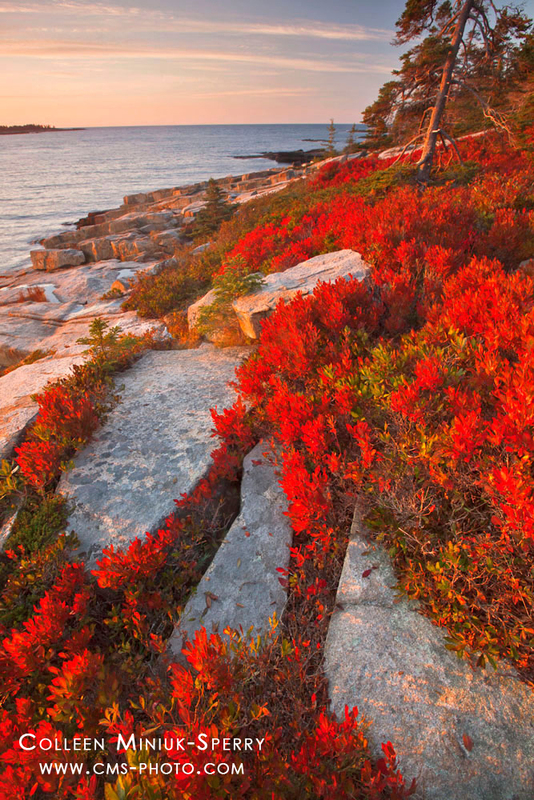 Greeting from Acadia National Park! 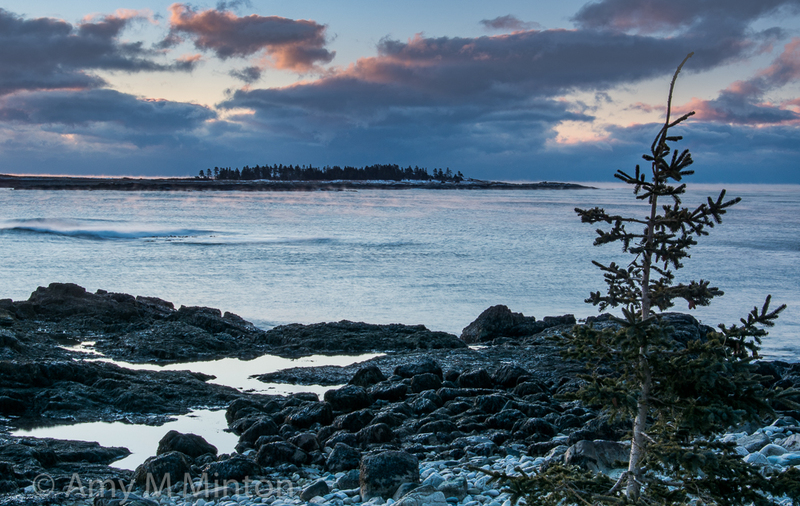 As a part of my current Artist-in-Residency in Acadia National Park, I am excited to be presenting “Connecting With Nature Through the Lens” program at the next SERC Institute Brown Bag session on this Friday, February 15 from 11:30 am – 1 pm at Moore Auditorium. Free to the public, but donations – which benefit solely the SERC Institute – happily accepted at the door. I know it’s a bit of a commute for the Arizona folks, but hopefully those in the Northeast, specifically Maine, can attend! For more information, visit http://www.sercinstitute.org/brown-bag-lunch-serc-connecting-nature-through-lens. Though I’ll be sharing more photos of my phenomenal, still-in-progress four-week residency soon, this bizarre and spectacular sunrise landscape happened yesterday morning along Ocean Drive near Boulder Beach. The peak of the recent blizzard, “Nemo,” occurred almost simultaneously with a higher than normal high tide on Saturday, causing monster waves to pound the granite-lined coast and create a wall of spray almost up to Ocean Drive! This, combined with frigid temperatures well below freezing, plastered rocks and plant life alike with a coating of salt spray along this section of coastline, creating these amazing small desert hoodoo-like formations. As if that find wasn’t enough, the glorious sunrise was one of the most colorful I’ve seen in all my days in the park! Technical information: Canon 5DMII, 16-35mm lens at 18mm, ISO 125, f/22 @ 1.6 seconds, 3-stop graduated neutral density filter, basic post-processing. For some married couples, spending the holidays with the in-laws is more intolerable than getting four wisdom teeth pulled simultaneously without anesthetic. Me? I lucked out. I love hanging out with my in-laws. When my husband, Craig, and I prepare to make our drive from Chandler, Arizona to Missoula, Montana at Christmastime, I eagerly pack my bags in anticipation of insightful conversations, hearty laughs, and much needed rest and relaxation. Leaving our hectic hometown lives behind, we heed the famous advice, “when in Rome, do as the Romans do” as soon as we pass through the blue-stained-pine door at the Sperry household. Time means something different in Montana. No one rushes to do anything. Except me, I rush to do nothing. Hugs and pleasantries exchanged, chilly hands happily greet bottomless cups of fresh brewed coffee as we start indulging in heart-to-hearts about where life has taken us since our last visit or phone call. Gathered around the den’s gas heater pumping out warmth for the entire house, no one in the Sperry family thinks twice when the person sitting closest to the radiant heat falls asleep during someone else’s intriguing story. In fact, these ad-hoc naps next to the hearth happen so frequently, it’s become a much photographed Christmas tradition, usually involving fake raccoon caps and other novelty props. Conversation eventually slows. Then, books from bookshelves against every free inch of wall fall into the eager hands of my father-in-law, two brother in-laws, their wives, one niece, three nephews, my husband and me. Occasionally, the youngsters interrupt, challenging the adults to a game of Clue or a match of pretend sword-fighting. We celebrate our wins and recover from our losses in the same way, by pouring another cup of coffee and staring out the large picture windows watching the gently falling snow. After three days of this peaceful Montana rhythm, thoughts of chewing my arm off enter my brain. Filled with endless energy, I almost explode like a vigorously shaken can of beer. Typically, I cope with my restlessness by throwing on winter clothes and disappearing outside alone to photograph the resident white tail deer feeding within arm’s reach of the porch, whether the weather conditions are optimal or not for photography. Unfortunately, this solution only lasts approximately seven minutes, as the warm desert blood running through my veins begins to freeze the moment I put on a wool hat and gloves. During our 2009 Christmas vacation, after 72 hours, my brother-in-law thankfully suggested a family day trip to a nearby ghost town, Garnet. My father-in-law agreed, “It’s been a number of years since we’ve been up there. And we’ve only gone in the summer. It would be neat to see Garnet in the winter this time.” The promise of a little exercise, fresh air, and a new adventure to a place I had not experienced excited me. Oh, who am I kidding, this outing was going to save my right arm! We needed to go quickly though, as the winding road to the historic mining town is only open until January 1st to high-clearance, four-wheeled drive vehicles willing to navigate the narrow icy track carved through deep snow in the Lubrecht National Forest. Thereafter, motorized vehicles are prohibited until the beginning of May, causing those who want to see this old town tucked deep in the mountains to endure a long and laborious 11-mile snowmobile, snowshoe, or cross-country ski journey. Opting for a shorter, more comfortable excursion, after breakfast, we piled into heated vehicles aptly prepared for winter driving. The hour-long adrenaline-inducing ride allowed me time to contemplate my love affair with ghost towns. No matter the location, the odds and hardships mining families had to overcome to have a life – not even a good life, just a life – fascinate me. Piecing together what a day might have looked like by studying what’s left behind intrigues me. It’s the “town” in ghost towns then, not the “ghost,” that brings out the curiosity in me. That said, I’d call myself a “skeptical believer.” I’ve never fully accepted that ghosts exist, but I’ve also not dismissed the notion, for a lingering childhood fear that the boogie-man (or far worse) might one day emerge from the abyss called my closet and chase me down the hallway while mournfully wailing, “Wooooo! Woooooo!” the second I formally shun them. In my 37 years, I’ve only experienced two situations I couldn’t explain, but I have always hesitated to blame paranormal phenomena for the lights suddenly turning off in my apartment during my senior year in college or the smell of rich cigar smoke being blown into my face five years ago at the infamously haunted Copper Queen Hotel in Bisbee, Arizona. As with the flashy special effects featured on the “Pirates of the Caribbean” ride at Disneyland, I have nonchalantly attributed both mysterious circumstances to the sly actions of the property management delivering supposed hauntings on precise cue. With buildings buttoned up and lower visitation during the winter months, the likelihood of such pranks occurring during our Garnet visit was low. So low such that the only spirit I thought about as we pulled into the snow-covered parking lot was how much of it the past inhabitants must have possessed to tolerate such isolation to survive here at the turn of the 20th century. Like so many other ambitious gold-seeking pioneers rushed to booming Western mining towns starting in the mid-1800’s, hardy men flocked to the Garnet Range once a rich ore vein was discovered in the Nancy Hanks Mine in 1895, marking the birth of the bustling town of Garnet. However, instead of bringing gambling, prostitution, and gun fights, these miners brought families with them and picnics, social dances, and sledding parties were common here, unlike the traditional mining camps across the West. The classic boom-and-bust cycle caused hasty construction followed by eventual abandonment, and over time, Mother Nature or various fires destroyed many of the empty, foundation-less buildings. 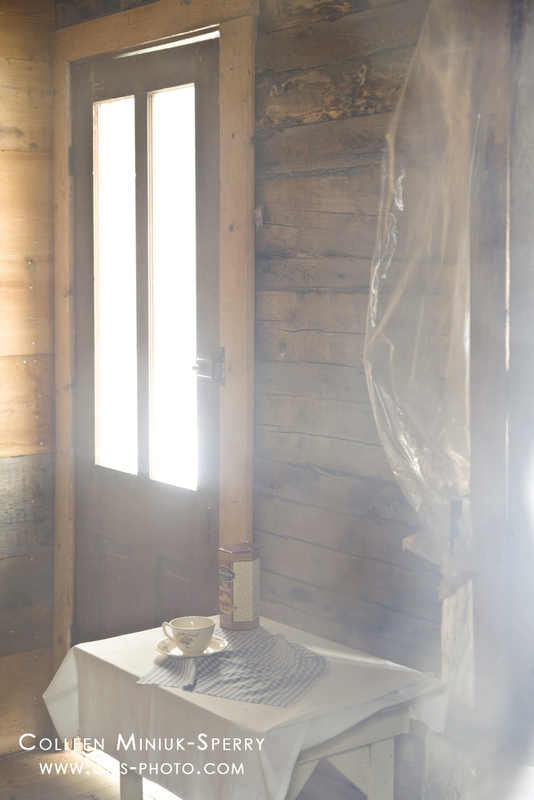 However, now on the National Historic Register and widely considered to be Montana’s best preserved ghost town thanks to efforts of the BLM and the Garnet Preservation Association, the handful of remaining structures continue to attract families from across the world to taste a bit of history. 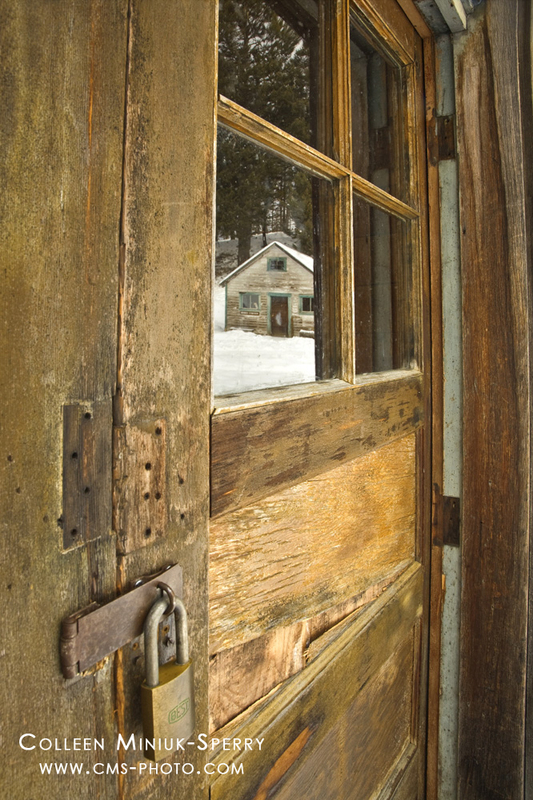 After descending the short half-mile plowed path to reach Garnet’s main street, my in-laws and I immediately peered inside windows and stepped into different miner’s cabins scattered across the snowy hillside to catch a glimpse of what was left behind. Curled bed frames in corners, rusted stoves on dirt floors, and tattered newspaper on the walls provided evidence of the good old days in Garnet…and a solemn reminder of how life must have been better somewhere else. Inside the Adams house. I used a “spooky” filter, (aka a shower cap) over my lens to render a hazy effect. 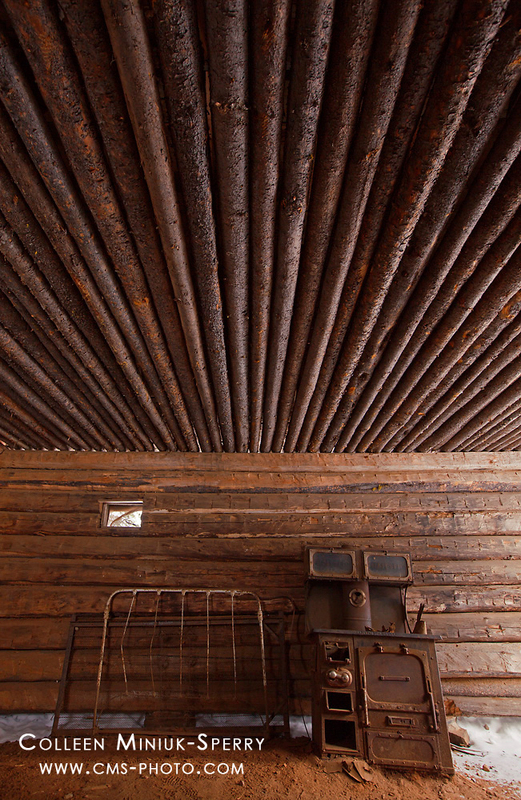 Captivated by the log cabin construction and mining relics gracing the exterior of one of the homes, I stayed behind at Dahl’s Cabin while the rest of the Sperry crew continued wandering around the rest of the well-preserved settlement together. 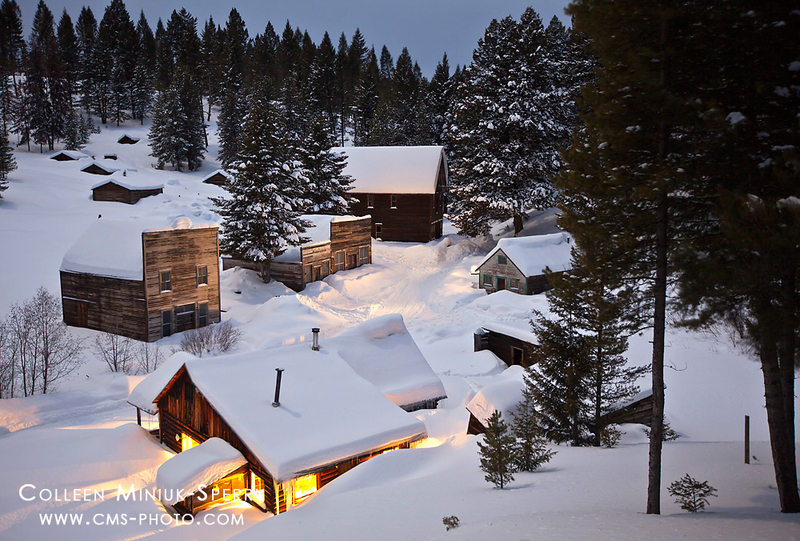 Hoping to evoke the feeling of spookiness in my photographs – after all this was a ghost town – I used icicles dangling from the Dahl’s Cabin to frame the distant Bill Hubner cabin (now the BLM Staff Office) a few hundred feet to the west. 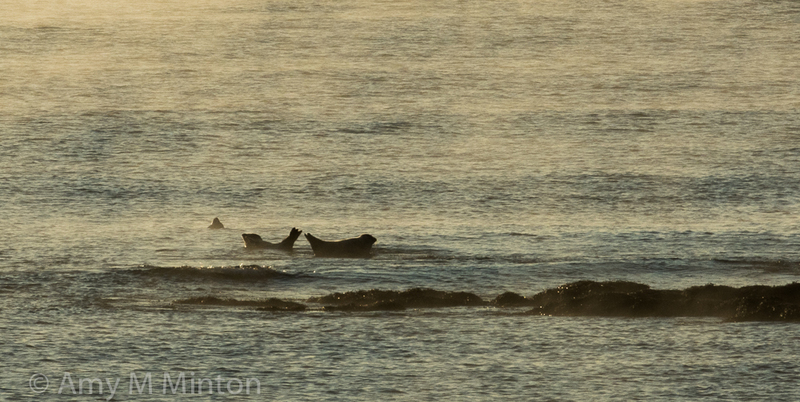 Quick glances at my camera’s LCD showed the softening and hazy effect I was striving for wasn’t panning out. I tried getting closer to the icicles such that they were essentially touching my lens, but that resulted in severe lens flare, circles that appear in an image when the sun reflects directly into the camera lens. Dissatisfied with my execution, I left to investigate the other remarkable structures and to photograph my brother-in-law and his daughter sledding in between reconstructed remnants of Davey’s Store and the J.H. Wells Hotel to cap off an enjoyable family adventure. With little fanfare, we quietly returned to the Sperry home in Missoula to the ceremonial coffee, conversation, and nap-inducing heater. That evening, I uncharacteristically began the tedious editing process on my photographs from our visit. With Craig peering over my right shoulder, I quickly displayed one by one my images on my laptop screen. Image #1: The un-manipulated, un-touched photograph out of my camera. 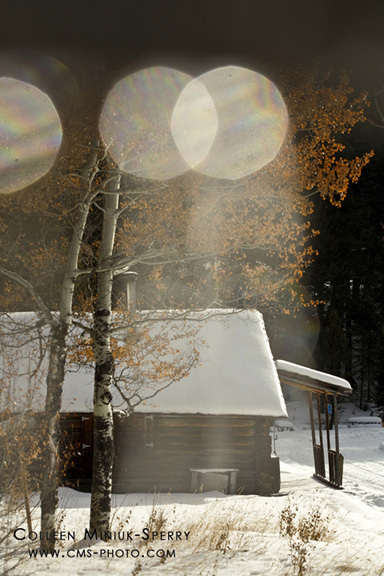 The face is is visible on the right side of the photograph in the trees just above the cabin roof line but below the lens flare circles. It may help to step back about 10-15 feet if you have difficulty seeing it. The Sperry clan hovered around the laptop and collectively dissected not only the photograph with the face, but also the entire series of images captured before and after. Everyone created their own viable explanation of how my camera and I could have captured a distinct face. After a day’s worth of on and off reviews and deliberations, we decided there was only one way to know if the face in the photograph was of ghostly origins. We must return to Garnet. Immediately. Image #2: The closest I could get to recreating the scene on our second visit to Garnet. After about a half-hour, I gave up and joined Craig and his Dad at the small Visitor’s Center, which welcomes guests only on weekends in the wintertime. The burly, no-nonsense ranger on duty – the kind of ranger you’d expect to find in the backcountry of Montana – warmly greeted us with a jolly smile. Hesitant to blurt out the real reason for our visit, we instead made casual conversation about the town’s history, the details of the displayed artifacts, and ho-hum, the likelihood of seeing ghosts in town during our visit. 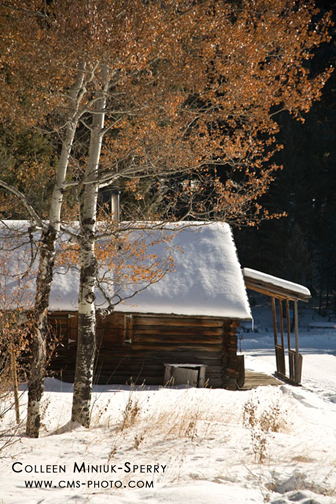 Our curiosity compelled us to follow with lead feet as the ranger led us to the Hubner Cabin. Inside, he hurriedly sorted through stacks of interpretative signs resting against the log walls. 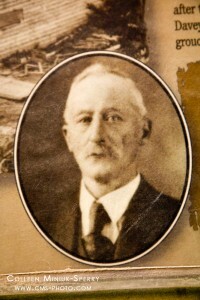 Around 1895, an astute businessman named Frank Davey filed on the Garnet mining claim. Although little information exists about his previous life prior to his arrival in the mining town, he purchased a store he later named “Davey’s General Merchandise Store” in 1898. This mysterious man occasionally mined for gold alongside the other hard working miners but kept busy running the Garnet Stageline, managing his general store, and overseeing much of the land on which Garnet was developed. Though certainly an asset to his town, the resident children didn’t think highly of him. In an interview conducted in June 2000, Frank Fitzgerald, who spent his childhood in Garnet, revealed, “Davey was kind of growly.” Lois Gates, who attended grade school in Garnet from 1935-1939, remembered him as “a scary old man” during an interview in March 2002. According to historical accounts from Lester Robinson, who moved to Garnet in 1937 when he was 10 years old, many people called Davey “Old Hurry” after frequently rushing patrons through his store. 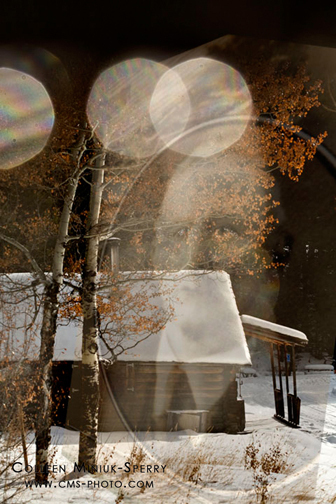 Image #3: The combination of the two images overlaid in Photoshop. By the late 1930’s, though, people started leaving Garnet to support World War II efforts. Davey strangely stayed behind. Considered the last man standing in Garnet, Davey collapsed while surveying his mining claim in the fall of 1947. Penniless at his death, the Elk Club buried Davey in Missoula. September 22, 1947 marked the birth of the ghost town of Garnet. Absorbing these new details from our second visit, Craig and I hopped in our car and anxiously headed home to Arizona. When I returned to desert, I quickly pulled up both images on my desktop computer and then used Adobe Photoshop to overlay the photograph I captured of Davey’s formal portrait photo on top of my photograph of the face (image #3). I turned the portrait slightly to match the direction of the man’s gaze in my photograph. The ranger was right. It was Frank Davey. The Outdoor Writers Association of America awarded this blog entry First Place in the “Outdoor Fun & Adventure” category in the 2013 Excellence in Craft awards.